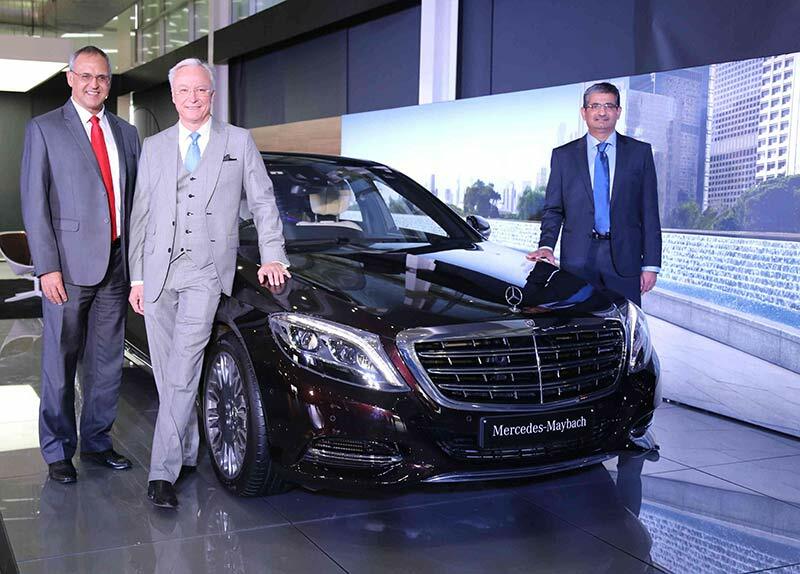 India’s leading luxury car brand Mercedes-Benz today launched the ultimate symbol of luxury motoring across the world, the Mercedes-Maybach in India. The pinnacle of luxury motoring was launched in India in two variants the Mercedes-Maybach S 600 and the S 500. The launch of the luxury saloon also marks the introduction of Mercedes-Benz’s new sub-brand ‘Mercedes-Maybach’ for the Indian market. 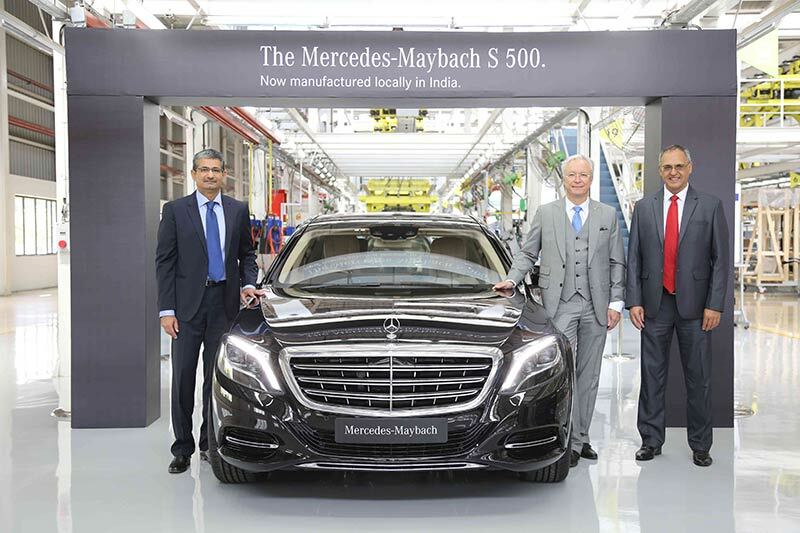 The Mercedes-Maybach S 500, which is the most luxurious Mercedes-Benz ever to be locally produced in India, was rolled-out of the assembly lines by Eberhard Kern, Managing Director & CEO, Mercedes-Benz India and Piyush Arora, Executive Director, Operations, Mercedes- Benz India. With the launch of the Mercedes-Maybach, we now expand the current range of the S-Class with the addition of a vehicle that sets a new benchmark for exclusivity and meets even the most discerning of requirements in terms of its appointments. 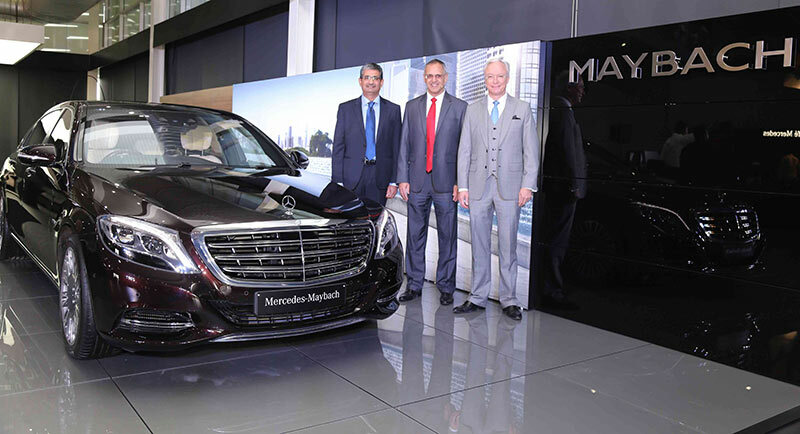 The Mercedes-Maybach, which is the most prestigious and exclusive offering from us till date, will strengthen Mercedes-Benz’s unparalleled presence in the topmost end of the luxury car market in India. 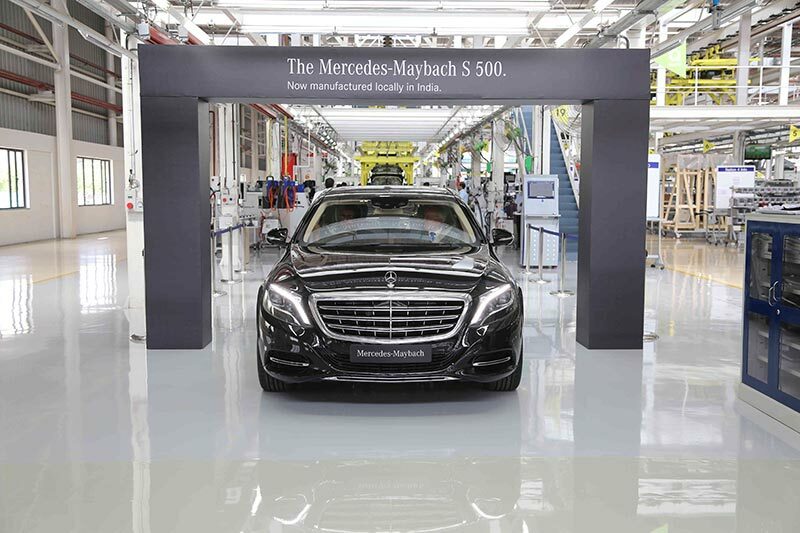 The start of local production of the Mercedes-Maybach S 500 is a landmark accomplishment for us and proves our high competence in manufacturing. This also underlines our constant endeavour to offer world-class products to our Indian customers with significant local value addition, in the shortest possible time. Mercedes- Maybach is one of the most technologically advanced products and its local production reflects the highest level of refinement and implementation of advanced technology and flexible processes in our manufacturing process. Mercedes-Maybach is the third product after the GLA and the CLA that we have rolled-out within the last few months. The Mercedes-Benz plant in India is part of the global assembly network, which comprises further locations in Thailand, Vietnam, Malayasia, Indonesia, and will be joined by Brazil in 2016 where a new assembly plant is currently under construction. At these sites, Mercedes-Benz produces cars for local markets with different production levels. Mercedes-Benz has established an exclusive offering in the exclusive top segment by introducing a sub-brand with the name Mercedes-Maybach. The Mercedes-Maybach is distinguished by extra spaciousness with lavishly designed, prestigious interiors which offers extensive scope for individualization. Mercedes-Maybach is not an equipment line, but a sub-brand that in future will provide Mercedes-Benz vehicles with more exclusivity. The sub brand provides both prestige and exclusivity and is aimed at customers for whom status, luxury and safety are of paramount importance. The S-Class is not only considered the best vehicle, but also the most successful car in its segment. With more than 100,000 units sold globally in its first full year of availability, the new S-Class is the best-selling S-Class ever. This success has been accompanied by a desire expressed by many customers for yet more individuality and exclusivity. The Mercedes-Maybach accomplishes this desire like no other sedan. The most unique safety feature debuting with the Mercedes-Maybach is the rear seat beltbags and cushion bags. The beltbag is an inflatable seat belt strap that reduces the load on the ribcage in a front impact and is thus able to reduce the risk of injury to passengers in the rear. With the introduction of the seat belt buckle extender, beltbag and seat cushion airbag, the Mercedes-Maybach possesses the most innovative passenger safety and features. For passengers in the rear seats, the Mercedes-Maybach is the ‘World’s Quietest Production Sedan’. Positioning the passengers away from the side windows towards the rear and triangular windows create a new acoustic situation. Special seals optimize the noise insulation, thereby ensuring excellent aeroacoustic performance in the rear. Mercedes-Maybach is equipped with the AIR BALANCE PACKAGE which includes fragrancing, ionization and even more efficient filtration. A premium room fragrance has been designed exclusively for this model and the AGARWOOD bottle itself is adorned with the Maybach lettering. Agarwood speaks of the centuries-old tradition of perfume. With its refined and elegant character, Agarwood makes a unique statement. Travelling in a Mercedes-Maybach S 600 can be celebrated in style with two high-quality, handcrafted champagne flutes. These silver-plated flutes have been made for the on-board bar by Robbe & Berking, silversmiths in Flensburg, Germany. Fine restaurants around the globe with several hundred Michelin stars between them are also customers of this luxury brand. The sliding sunroof in a Mercedes-Maybach S 600 is available with optional MAGIC SKY CONTROL technology from Mercedes-Benz. The glass can be switched to light or dark at the touch of a button and thus creating a special interior ambience. In its exterior design, the Mercedes-Maybach combines stylish, effortless superiority with trend-setting exclusivity. The extended wheelbase and emphatic lines adds dynamism to the exterior design. The rear seats are situated beyond the door cutout, creating a feeling of exceptional privacy and exclusivity. The elegant Maybach logo – a double M inside an arched triangle – adorns the C-pillars on both sides. The Mercedes-Maybach is 207 mm longer than the S-Class with long wheelbase. 200 mm of this is the result of the extension between the B and C-pillar. All this additional space is used to boost comfort for rear passengers. With its clear architecture, refined materials and stylish controls, the vehicle interior embodies sensuous elegance. For an exclusive look, the front centre armrests with nappa leather upholstery feature embossed Maybach crests (and also the armrests in the rear in conjunction with the First-Class rear suite). Another special feature in the dashboard is the analogue clock with an IWC design. The extremely plush interiors of Mercedes-Maybach epitomises luxury with the rear seats with ‘Hot Stone Massage’, the optional 2×2 seats with folding table, the standard extended leg support for both rear passengers or the rear seat entertainment system. The list of high-end luxury features in the Mercedes-Maybach S-Class makes it highly exclusive for a luxury sedan produced in India. The unique features of Mercedes-Maybach S-Class comprises a AIRMATIC suspension, exclusive nappa leather upholstery, AIR BALANCE PACKAGE, PRE SAFE rear package with rear seat beltbag, Burmester 3D surround system with 1540 watt with 24 speakers and seven colour ambient lighting, Night View Assist Plus and Chauffer Package. The exclusivity of Mercedes-Maybach S 600 remains in the host of additional luxury features the sedan offers. The Mercedes-Maybach S 600 additionally features the unique MAGIC BODY CONTROL suspension, MAGIC VISION CONTROL, SPLITVIEW, Head-Up Display, Front seat massagers for driver and co-driver, Anti-Theft Protection Package just to name a few. The Mercedes-Maybach S 600 and S 500 are available with numerous new safety and assistance systems that make driving even more comfortable and safer. The impressive list of the sedan’s standard safety and assistance features includes: 12 airbags, Night View Assist Plus, 360 degree camera, Active Parking Assist, LED with Intelligent Lighting System, Crosswind Assist, PRE-SAFE® IMPULSE and Tyre Pressure Monitoring System to name a few. The Mercedes-Maybach S 600’s V12 biturbo engine generates an output of 390 kW (530 hp), with a displacement of 5980 cc and the maximum torque of 830 Nm. It completes the sprint from 0 to 100 km/h in 5.0 seconds, while the top speed is 250 km/h (electronically limited). The V8 biturbo engine in the Mercedes-Maybach S 500 has a displacement of 4663 cc and an output of 338 kW (459 hp). The peak torque is 700 Nm. The Mercedes-Maybach S 600’s comfort package features the MAGIC SKY CONTROL, the luxury packages feature 2 x 2 seats with folding tables and features refrigerated compartment with champagne flutes. Brown high-gloss burr walnut wood trim, black high-gloss poplar wood trim, designo metalized ash wood trim, designo brown high-gloss sunburst myrtle wood trim and black designo piano lacquer trim. The customers can choose from a host of exterior and interior colour options. Interior colour upholstery options in exclusive nappa leather are black, silk beige, crystal grey, nut brown and porcelain. The exterior colour options are magnetite black, obsidian black, iridium silver, cavansite blue, peridot brown, ruby black, diamond silver, anthracite blue and designo diamond white. 19” multi spoke alloy, 19” 5 twin spoke alloy and 19” multi twin spoke alloy.